INFECTIOUS MESSAGING · Example 2: The Hear t Attack Grill STICKING WITH THE HAMBURGER theme, I present you with this lovely beast. It's not the healthiest-looking burger, but being healthy is not its claim to fame. You might expect a burger like this to come from the Fatburger restaurant chain. 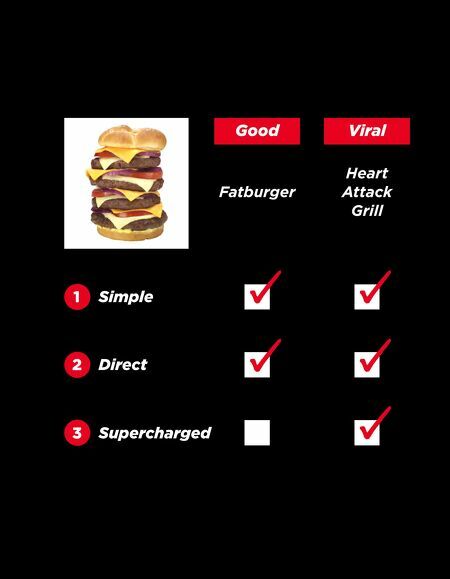 The Fatburger brand is simple and relatively supercharged. 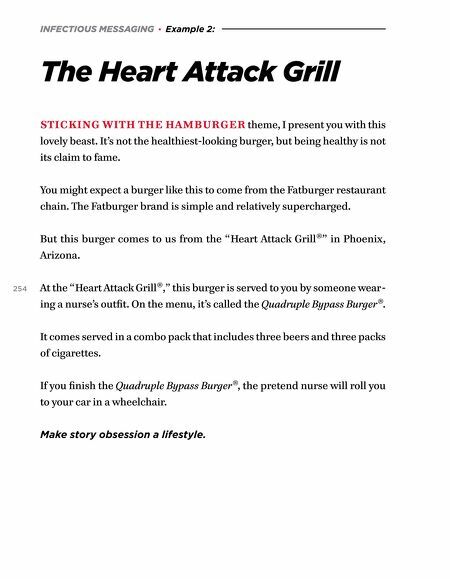 But this burger comes to us from the "Heart Attack Grill®" in Phoenix, Arizona. 254 At the "Heart Attack Grill®," this burger is served to you by someone wear- ing a nurse's outfit. On the menu, it's called the Quadruple Bypass Burger®. It comes served in a combo pack that includes three beers and three packs of cigarettes. If you finish the Quadruple Bypass Burger®, the pretend nurse will roll you to your car in a wheelchair. Make story obsession a lifestyle.